million people in China with high blood pressure at that period. Normal Blood Pressure Group: less than 140 mm Hg (systolic pressure) over 90 mm Hg (diastolic pressure). Taijiquan, however, this group did not need to enter a hospital due to the condition of their blood pressure. practice of Taijiquan provides a multi-regulatory action toward controlling blood pressure. pressure during and immediately following practice. the arteries in middle aged and elderly people. regulated with continuous practice of Taijiquan. Anyone interested in finding out further information about these and other styles of Chinese martial arts should contact Ted at the following email address twk901@gmail.com. Today is Master Mei Yingsheng's 80th Birthday. I wish him a Happy Birthday and a Long Life! 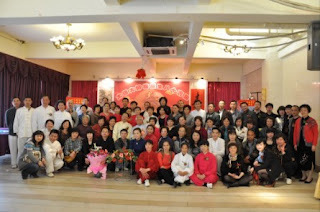 Many of Master Mei's students joined together in Chengdu today for a big Birthday celebration. Ted, twk901@gmail.com, who teaches in Cleveland, Ohio, is a sixth generation Yang style Taijiquan lineage holder and a national grand champion in Chinese martial arts. Ted holds a Masters degree in Geology and is certified through the Ohio Board of Education in the field of Chinese language and Science. Ted is a professional Chinese language translator with many years of experience. Ted was the USA All Around Internal Grand Champion in 2003 by winning seven gold medals at the US National Chinese Martials Arts Championships. Ted was also a gold medalist at the USA All-Taiji Championships (A Taste of China ) in 1993. In 1994, Ted was a gold medalist at the USA National Chinese Martial Arts Competition held in Orlando, Florida which ranked him number one in the USA.